It must be something in our beer but another newcomer on the golf apparel scene has emerged with a little something different. Votary Golf has only been online selling their apparel since May but they’re already making a name for themselves online at golf fashion aficionado Chapeau Noir Golf. Who doesn't like to get new, shiny, dudes to wear on the golf course especially when your about to head to one of the top Golf Destinations in North America. So I was definitely all smiles when I received my Inertia Azure Polo Shirt and Angus White Shorts along with a Signet White Belt just before heading on vacation in July to PEI. Only fitting Votary Golf, a Canadian company would makes it debut for me on the golf courses of PEI. I mainly wear shorts when I’m golfing so being able to review some shorts from Votary Golf in PEI was great. The lightweight fabric used in the Angus shorts made them a pleasure to wear in the heat of the PEI summer. Definitely the lightest shorts I’ve ever worn. They aren’t your traditional short so they did take a bit of getting use to as they fit slimmer. The smaller front pockets are good for just a few tees and marker while the back pockets are much deeper for your scorecard. My favorite feature of the shorts is the contrasting trim on the back pockets and the "Devoted To Golf" inside the zipper . Nice touch Votary! The Inertia Azure polo fit great right out of the box. The two things you’ll notice right off the bat with this polo is the length of the body and the shorter sleeves. 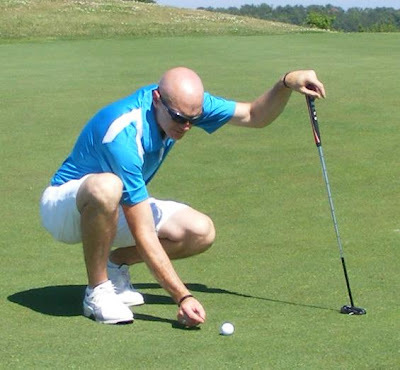 Being a taller golfer I loved the fact this shirt when tucked stays tucked during my rounds. I also really liked the slim and shorter fitting sleeves makes it easy to take a free swing at the ball. The color of the shirt really went great with the shorts/belt. I always love a good belt. Just look at the pros and the belts they wear, Poulter, Ryo and Rickie these are some serious accessories. Votary didn't disappoint with the Signet White Belt complimenting the polo shirt and shorts. Made of soft Italian leather with the Signature Votary buckle. This belt stands up to all my current white belts. Just make sure you follow Votary sizing chart when ordering your belt. I’d even go one size up after using the chart just to be on the safe side. Votary Golf’s slimmer lines and color combination might not be for everyone but their apparel held up like many of the top apparel companies I’ve had the pleasure to review. Votary's apparel has an amazing soft feel when golfing due in part to the polyester/spandex blend fabric. 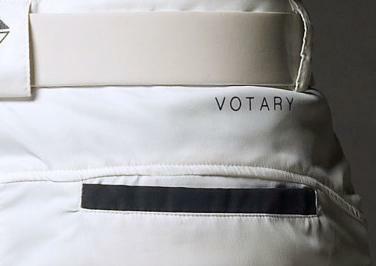 Votary's apparel was great for golfing during the hot and humidity of the Summer. Their customer service also stands out. Any questions you have call them and they'll give you the answer and I love the fact they offer free shipping in Canada. If you happen to order the wrong size just send it back and get the right size, no charge. Votary Golf hasn’t been around that long (officially launched online in May) and although you may not know the name I believe you will with more exposure from their brand of golf clothes. Their line for this year had limited colors/styles but from talking to Jason Galindo one of Votary Golf’s owners you’ll see more next year. It was great to see Votary make the trek from Toronto to showcase their clothes here in Ottawa at the 19th Tee Driving Range. So you’ll be seeing more of them in the future with quality clothes and great customer service. Votary Golf definitely makes Ottawa Golf Blog's cut. be sure to follow Votary Golf on Twitter and Facebook. Amazing blog, mate. i enjoyed reading this, thanks for sharing with us. Outstanding blog. The handwriting style is higher-ranking and the content is relevant. Thanks for posting this information. Much appreciated!